This is the first page drawn on my new Yiynova 20u, which was 100% reader funded. Here it is next to my cute little computer. It’s more than twice as big than what I was drawing on previously. I’ll write a more thorough review once I’ve used it more, so far I’m pretty happy with it. Well, the artwork is as fabulous as ever… The photo of your setup gives a great sense of the size of the new Yiynova 20u. I’m glad you have such a sweet rig. Thanks for sharing! But I still say the same thing as always: don’t overdo it! I really enjoy the updates, and not coloring them is fine. Your health should come first. Nice setup, just curious whats the specs of your computer? Built almost two years ago now. First thing to get upgraded will be the graphics card sometime next year. 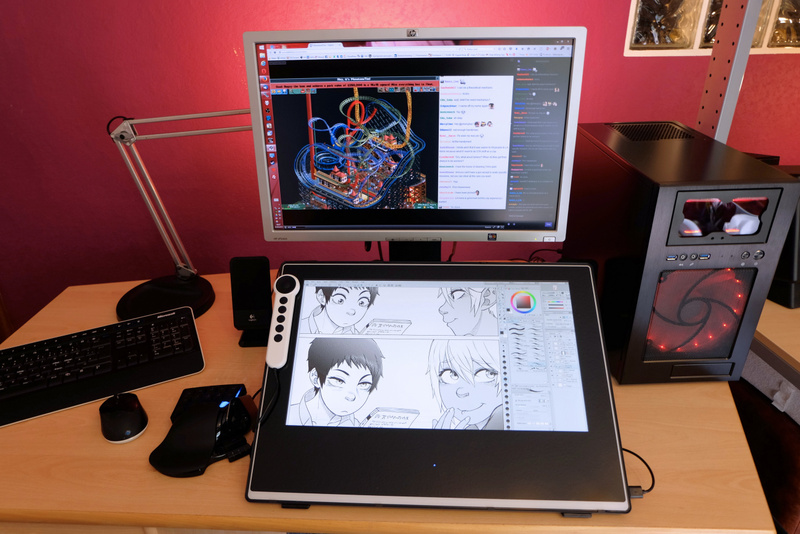 I have a hard time believing you are any kind of artist with how clean that workspace is. I cleaned it up for photo taking, since I’m self conscious like that. You really don’t want to see it in it’s usual state. Wow, that’s a really nice piece of kit. And I agree with Marscaleb – I’m not an artist, but you should see all the crap on my workspace! …and if I ever needed to clean it up for photo taking it would take me a week and then I’d be too exhausted to take the picture anyway! What’s that program on your computer? It looks fun. A stream of Rollercoaster Tycoon. I usually watch Twitch while drawing. i don’t know about none of that stuff, but i’m glad it’s working out for ya Drake! 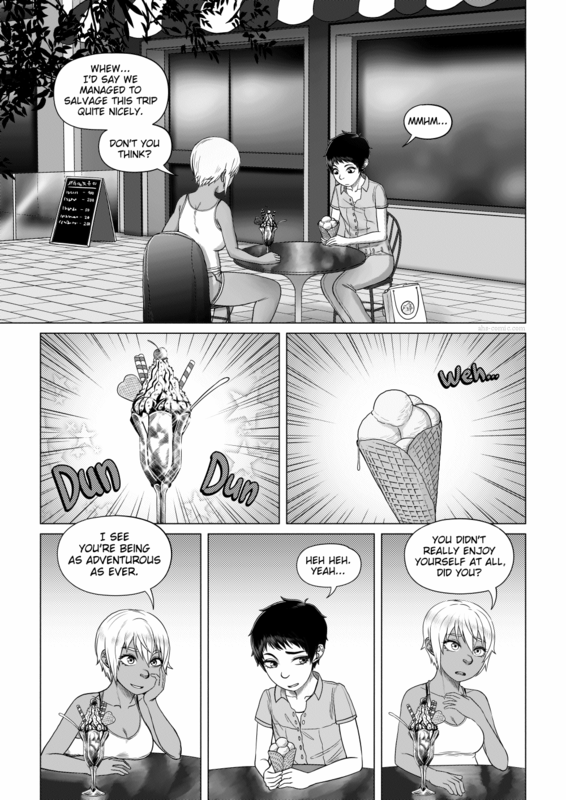 “Weh” is possible the most fitting sound effect for that ice cream you could’ve picked. It’s honestly just so funny to me. “Weh”. Ha! I love these characters! Great work. I love the story and the girls. Please keep one scene to get a good glimpse of the complete dress whenever they change their outfits.